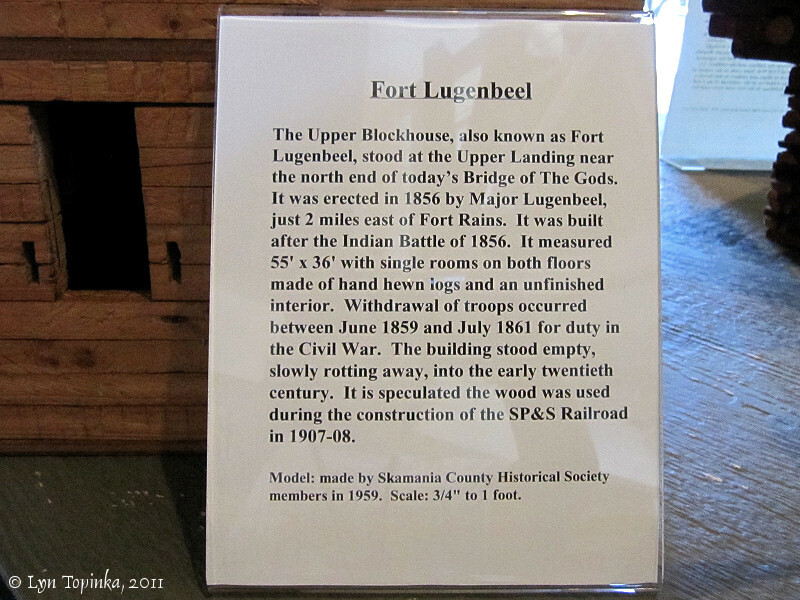 "Fort Lugenbeel, Washington ... (Upper Blockhouse)"
Click image to enlarge Sign information, Fort Lungenbeel Blockhouse. Information sign located at the site of "Fort Rains", downstream from Ashes Lake. Caption reads: "The Upper Cascades was only a village during the March 26, 1856 battle. Civilians defended themselves from nearby Bradford Store until Colonel George Wright caused the Indian withdrawal on the 28th. He ordered immediate construction of Fort Lugenbeel." Image taken April 22, 2006. 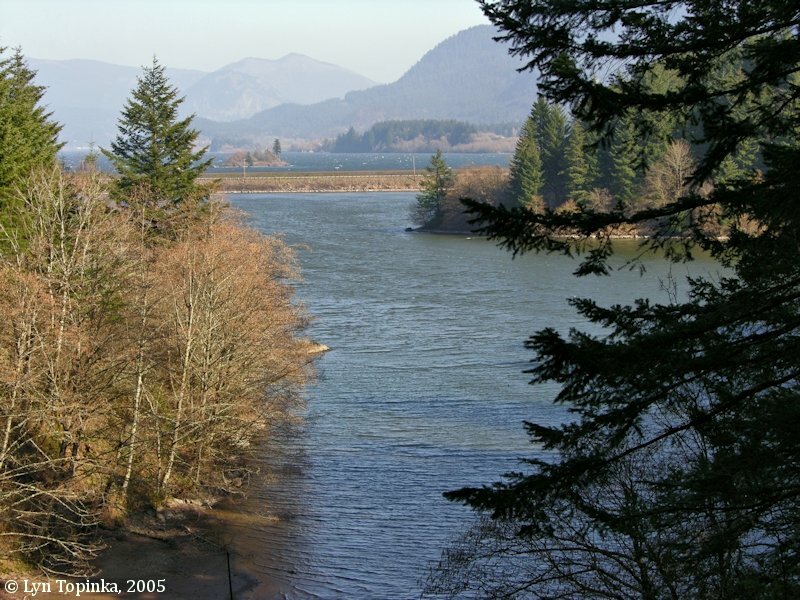 On March 26, 1856, Indians attacked the white settlements at the Cascade Rapids. 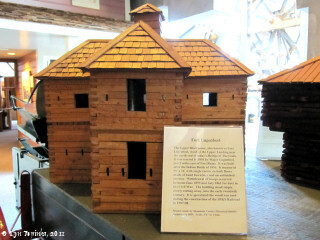 Settlers took refuge at Fort Rains and Bradford's Store. The Fort Cascades was burned to the ground. The settlers were rescued by Lieutenant Sheridan who arrived March 27, 1856. Gunfire was exchanged the rest of the 27th and 28th, with the Indians surrendering late in the evening on March 28, 1856. 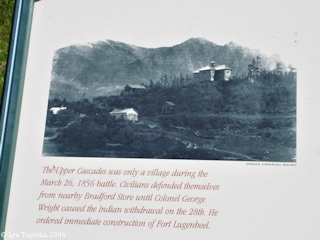 After this battle, Fort Cascades was rebuilt and another blockhouse, Fort Lugenbeel, was added to protect the Upper Cascades. Fort Lugenbeel (also known as the "Upper Blockhouse") was located on the north bank of the Columbia, on a hill, near today's Little Ashes Lake. Presumably the fort was named after Major Pinckney Lugenbeel, who, in 1856 was a captain in the 9th Infantry and was engaged in the defense of Fort Cascades. In 1862 Major Lugenbeel became Commander at the Army Post, Vancouver Barracks. Click image to enlarge Penny Postcard: Fort Lungenbeel, "Famous Block House on the Columbia River", ca.1910. 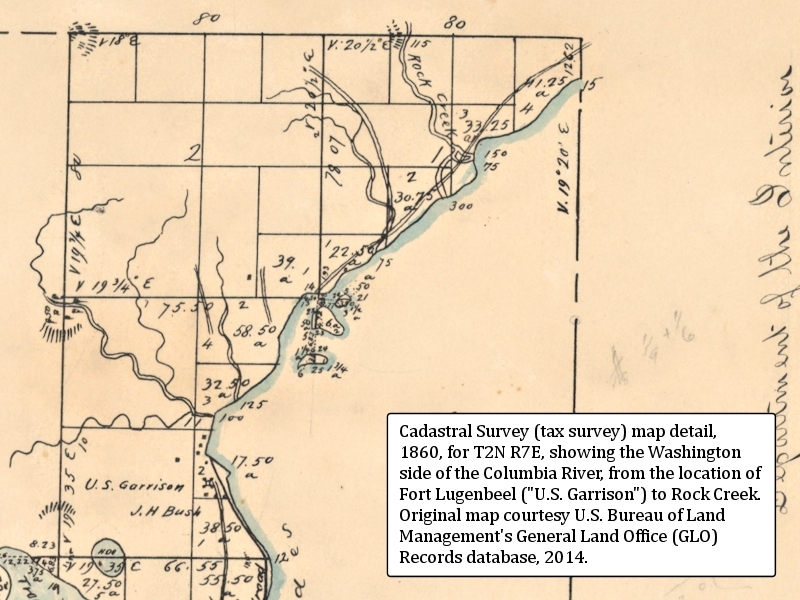 Click image to enlarge Cadastral survey map (tax survey) detail, 1860, for T2N R7E, showing the Washington bank of the Columbia River from Fort Lugenbeel ("U.S. Garrison") to Rock Creek. 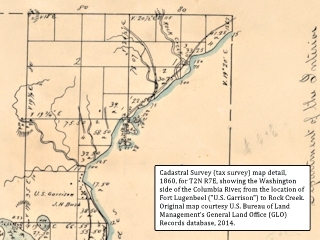 Original cadastral survey map courtesy U.S. Bureau of Land Management's General Land Office (GLO) Records database, 2014. 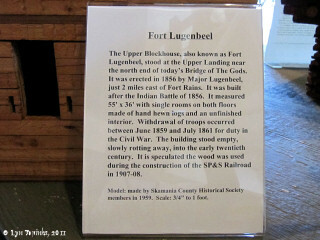 Click image to enlarge Information sign, Fort Lugenbeel, Columbia Gorge Interpretive Center, Stevenson, Washington. Image taken July 15, 2011. Fort Gilliam and Fort Lugenbeel were located on the Washington side of the Columbia in a "Deep bend" above today's Ashes Lake. This area, at the upper end of the Cascade Rapids, was known as the "Upper Cascades" or "Upper Landing".